“IDEF0” is known to be an acronym for the “ICAM Definition for Function Modelling”, being one of the most popular and widely used function modelling methodology. It is usually used for describing any needed manufacturing functions, offering a so called functional modelling language, widely used for conducting the analysis, development, re-engineering as well as the integration of different business processes. It is commonly used in the information systems and for conducting any needed analysis in such field of business activity, as software engineering. The “IDEF0” is known to be simply one of the parts of the “IDEF” family of the modelling languages. The “IDEF0” is used in the software engineering of the business activity, being built on the functional modelling language — “SADT”, which is another acronym for the “Structured Analysis and Design Technique”. Such method was created for a reason of simplifying the activities, actions and decisions of some organization as well as system while modelling. It was derived from the already well-established graphic modelling language called “SADT”, which was developed some time ago by the “SofTech” company. “IDEF0” can be defined as a graphical modelling language being a commonly used methodology for developing models. It is usually used for showing the system control, data flow and functional flow of different lifecycle processes. With help of IDEF0 it is always possible to represent a wide range of manufacturing as well as other business operations of any complexity in a graphical way. Using such methodology enables to provide the precise and rigorous description. Also, you can always use it for promoting the interpretation and usage of some system. IDEF0 is also widely used for modelling different non-automated and automated systems, being used for defining the requirements for new systems, designing the implementations and specifying the functions, and so meeting all the needed requirements. It can be also used for simply analysing all the needed functions within some particular systems during the period of time while such systems perform. It can be used for recording all the needed mechanisms of such systems too. Thus, applying an “IDEF0” to some system means simply starting a process of creating a model, which is expected to be consisted of a hierarchical series of text, diagrams and glossary, known to be referenced to each other. Two main modelling components are known to be “functions”, illustrated in a way of a diagram using such shapes as boxes, and “data”, plus the objects related with each other. IDEF0 is known to be simply a model which consists of a hierarchical series of glossary cross and diagrams, text, etc., which are known to be referenced to each other. There are usually two main modelling components are mentioned within such drawings, which are known to be functions represented on a diagram with help of such shapes as boxes. Any data represented with help of such diagrams, is usually mentioned in a way of using different graphical objects, interrelating all the previously mentioned functions, which are, as a general rule, represented by arrows. The IDEF0 model is the one which is so simple to create having only one tool — a ConceptDraw DIAGRAM diagramming and drawing software. The mentioned application is known to be a great alternative of many other ones that have no support for Mac, as MS Visio, for example. At the same time, ConceptDraw DIAGRAM software works both on Windows and on Mac. Also, all the files created by using some other applications can always be imported to ConceptDraw DIAGRAM and all the files created in ConceptDraw DIAGRAM can be always opened in other applications and edited, if needed. The very start of the IDEF0 process begins with, first of all, the identification of the very prime function which is expected to be de-composed, being identified by drawing a so called “Top Level Context Diagram”, that helps defining the scope of some IDEF0 analysis which is being conducted. You can always create any diagram, including the IDEF0, having only one tool — a diagramming and drawing software — ConceptDraw DIAGRAM There’s also a new product of CS Odessa, which you can use for simplifying your work with the mentioned software — ConceptDraw STORE, available to be downloaded from this site. Having the mentioned IDEF0 Diagram Software extended with so called “IDEF0 Diagrams solution” means having a very powerful vector drawing and diagramming software, which you can use for creating any needed IDEF0 Diagram of any complexity. It usually takes only a few hours or even a few minutes to complete the smart looking drawing having all the needed tools, such as the pre-made design symbols and examples of the diagram you want to draw. Using the pre-made templates means making it possible to edit the drafts for your own unique models having the final result looking simply professional and great looking. All IDEF0 diagrams created with help of ConceptDraw DIAGRAM diagramming and drawing application are known to be the vector graphic documents which can be always reviewed, modified as well as converted to some other file formats. To obtain such other format documents created in the other, but ConceptDraw DIAGRAM applications, you can always use the wide range of the existing and available to all the ConceptDraw DIAGRAM users’ export possibilities of ConceptDraw DIAGRAM software. 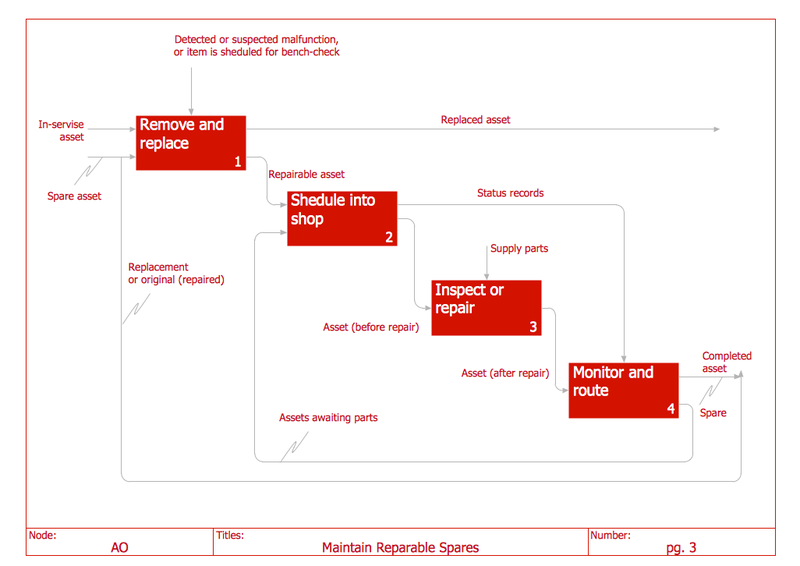 This example was created in ConceptDraw DIAGRAM using the IDEF0 Diagrams solution and illustrates the IDEF0 notation usage for drawing a Maintain Reparable Spares process diagram. An experienced user spent 10 minutes creating this sample. 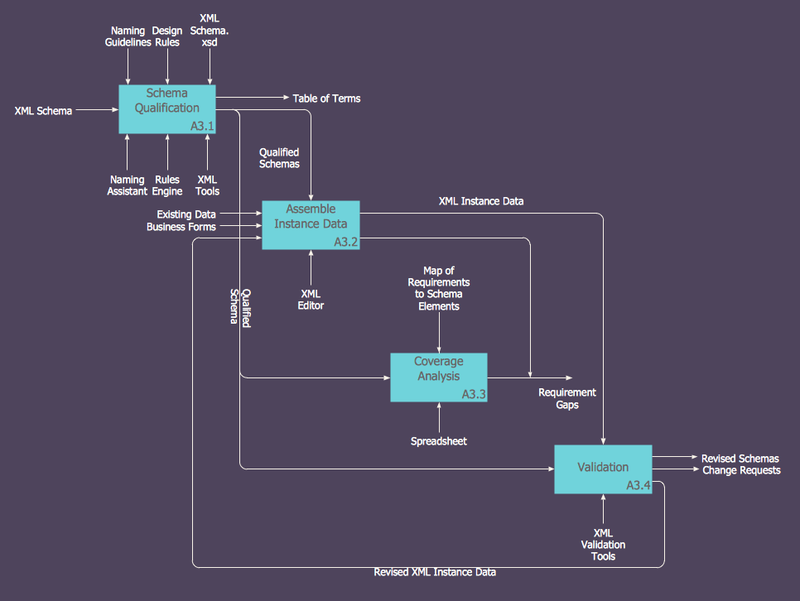 Use the IDEF0 Diagrams solution to draw the professional looking IDEF0 diagrams for functional modeling the information systems, business processes or software. All source documents are vector graphic documents. They are available for reviewing, modifying, or converting to a variety of formats (PDF file, MS PowerPoint, MS Visio, and many other graphic formats) from the ConceptDraw STORE. 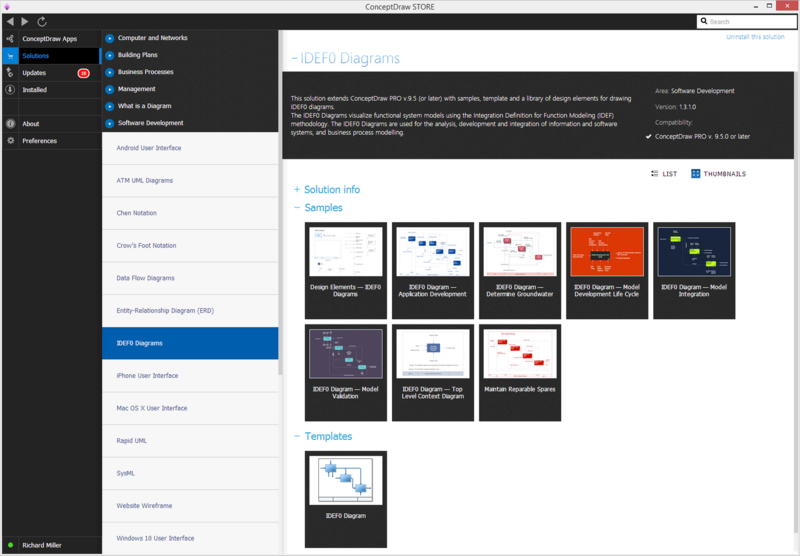 The IDEF0 Diagrams solution is available for all ConceptDraw DIAGRAM or later users.